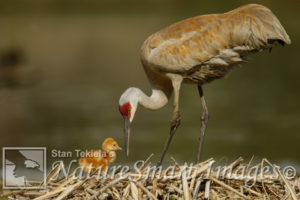 In this week’s post, author, naturalist, and wildlife photographer Stan Tekiela pauses to tell us about his observations of Sandhill Cranes. I’ve been doing a lot of sitting this spring. Over many days, while filming a Sandhill Crane nest, I’ve had lots of time for contemplation. For three years, I have been photographing a pair of Sandhill Cranes nesting, and this year they built their nest in the best place possible, allowing me to study their behavior in detail. In early April, after spending several days constructing the nest, the female laid two eggs and began to incubate them. Incubation (from the Latin incubationem, translating to “a laying upon eggs” or “to lie on, rest upon eggs”) is the process of an adult bird, male or female, laying upon eggs in order to control the environment in which the eggs are nestled. So the temperature, the level of humidity, and also the oxygen surrounding the eggs are all controlled by the adult birds sitting on eggs. In order to control the environment within the nest, the nest construction is extremely important for many species. Most bird species need their eggs to be incubated right around 99 degrees F. Because the body core temperature in most birds runs around 106 degrees F, it seems like a no-brainer to achieve the incubation temperature. However, the problem is what lies between the body heat of the bird and the eggs that need warming is the best insulating thing on Earth—feathers. Transferring heat through a thick layer of feathers is the challenge. To overcome this, many species of birds will shed feathers on the belly of the adult, producing what is called a brood patch. It exposes the bird’s belly skin, thus allowing for direct skin-to-egg contact. This allows efficient transfer of body heat from the adult to the eggs. What I find amazing in the case of my Sandhill Cranes is that the female and male take turns incubating. Incubation takes 28-30 days. Twenty four hours a day, seven days a week, for a month, one of the cranes is sitting on the eggs. This amount of inactivity could bring challenges of its own. If you and I were to sit down for a month, we would experience muscle atrophy or a general breakdown and weakening of our muscles. But that doesn’t happen with these birds. In the bird world, the shortest incubation is only 11 days in some of our smaller songbirds. The longest incubation period of any bird species is 70-80 days for the Wandering Albatross. Each parent takes shifts of upwards of 30 days. The longest incubation of a single bird without help from a partner is 64-67 days for the Emperor Penguin. Interestingly, it is the male who does all of this long-term incubation, not the female. In general, the smaller the bird species, the shorter the incubation period. The incubation period increases as the bird species becomes larger. Unlike mammals, which give birth to live young, all of a bird’s young development occurs within the egg. When the egg is first laid, it contains everything the young bird needs to develop. For the past month, I have been watching the Sandhill Cranes sitting on the nest. Hour after hour, day after day. Finally, after 30 days, the colts have hatched. The first one hatched, followed by the second baby crane the next day. The babies spent two days in the nest before they were strong enough to follow their parents and walk off into the world. 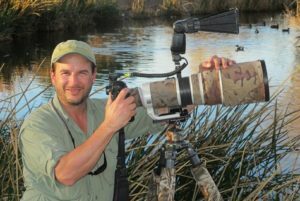 In his book Cranes, Herons & Egrets, Stan Tekiela shares with us his love for these majestic birds.